Original Release Info: I Razor, by Todd Tobias and Circus Devils, is the soundtrack to the no-budget experimental feature film of the same name directed by Todd Tobias. 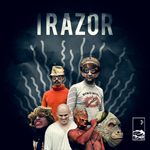 The I Razor soundtrack comprises challenging, playful, twisted, murky and downright beautiful pieces of music by Todd Tobias and Circus Devils, featuring vocals from Robert Pollard (Guided By Voices) as well as instrumental versions of some of the Devil�s existing songs. The album is a cinematic feast within itself, uncompromising, redemptive and always engaging. It weaves lo-fi keyboards through shimmering guitar textures, scatters unsettling rhythms across ethereal synthscapes, and unveils kaleidoscopic new treasures among its 30+ tracks with each listen. Told from the perspective of a former scientist turned wandering telepathic man-child, I Razor is the story of one man�s quest to regain his lost humanity. I Razor presents its world in hallucinatory visions, reflecting the state of mind of its main character. The story is told with minimal dialog and an open plot structure, relying instead on visuals and music to carry it's narratives. The limited edition CD release consists of composite artwork printed across transparent sheets and 4 panel art paper, sandwiched together in a clear vinyl pocket. This first edition is limited to a run of 100 units. All CD orders come with an immediate download of the album. Extended digital album booklet also available online at Hidden Shoal. Optionally available as MP3 or FLAC download.